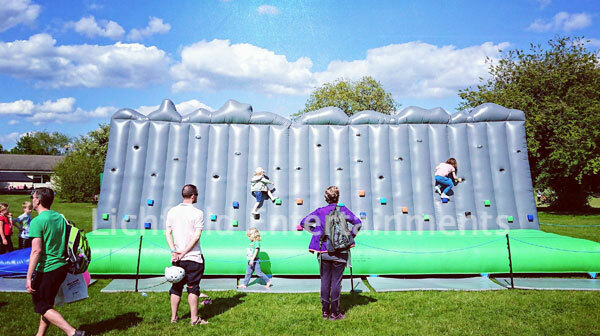 Our inflatable Traversing Wall is a great climbing activity for those wary of heights, those too small for climbing towers, or for events where it's not possible to get a large towable climbing wall on site due to access. 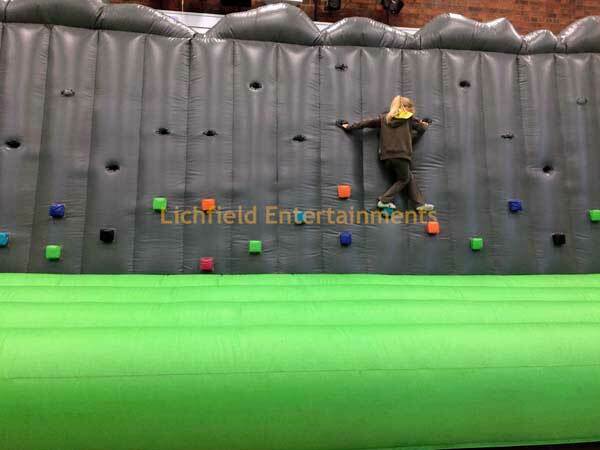 The Traversing Wall is suitable for use by users up to age 14 and is supplied with a friendly member of staff to ensure its safe use as standard. Instead of climbing upwards the aim of the activity is to traverse your way across the climbing wall using the hand and footholds without falling back on to the inflatable mattress. Because there's no real height involved there's no need for climbing harnesses and that in turn speeds up the turnover of user numbers. The Traversing Wall is always supplied with a friendly member of staff to ensure its safe use and ensure all runs smoothly for your event. The inflatable requires an overall operating area of 48x20ft and if being used indoors a height clearance of 12ft. If you have any queries, questions, or would like to book the Traversing Wall for your event please click here to enquire and we will do all we can to help.